Question: Can you kindly explain what are the potential realizations in each stage of chanting i.e. nama-aparadha, nama-abhasa, and suddha-nama? 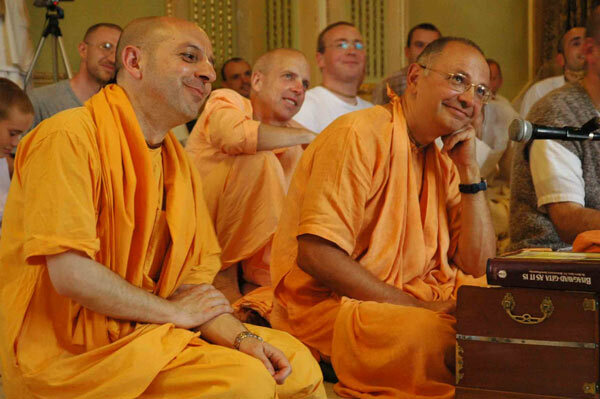 Is there any positive realization (that which is favorable to Krishna consciousness) for a person in nama-aparadha stage? In other words, how can one know that one is progressing from one stage to another? This spring I revisted the place where I edited the “Darsana” book for six months. 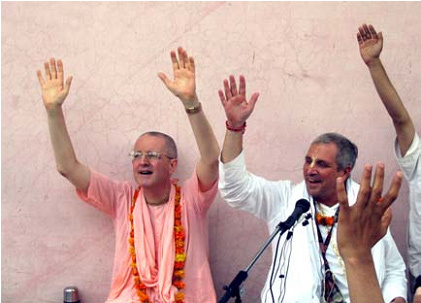 You should visit it, too — Hare Krsna Village, near Milan — to see beautiful Deities. Sri Sri Gaura-Nitai and Sri Radharamana have jewelry decorating Their waists and wrists that is custom-made by devotees. Their outfits and the backdrops are first-class. The new altar is especially attractive. 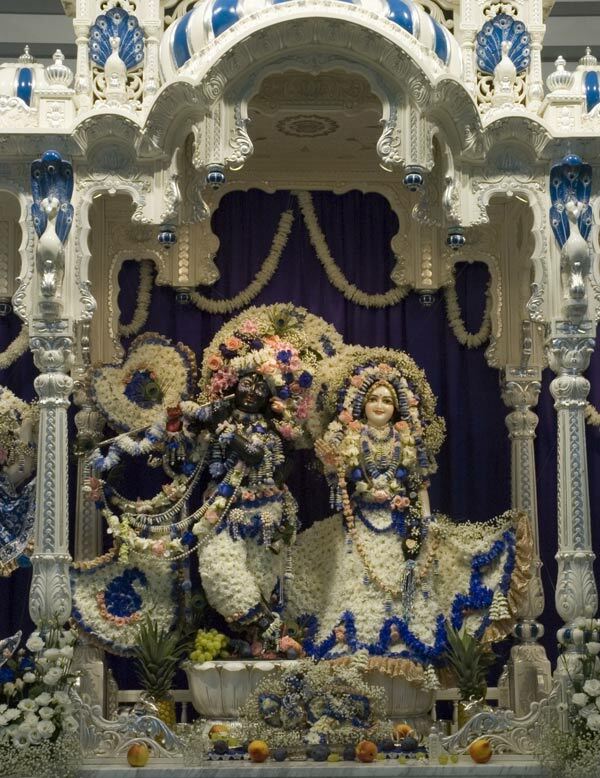 The temple room was renovated in the past two or three years, and a new, carved wooden altar from India was painted off-white, with trim of blue and silver (Srila Prabhupada’s vyasanana matches it). Absolutely elegant! The modern Deity kitchen is always producing wonderful offerings, and the pujaris are devoted and talented. The old temple-room roof was raised. Large new windows near the ceiling and floor admit lots of light. The ceiling is finished in a professionally done pattern of silver stars. History will be created when a Hindu prayer will be recited at the opening of the US Senate in Washington DC on July 12. 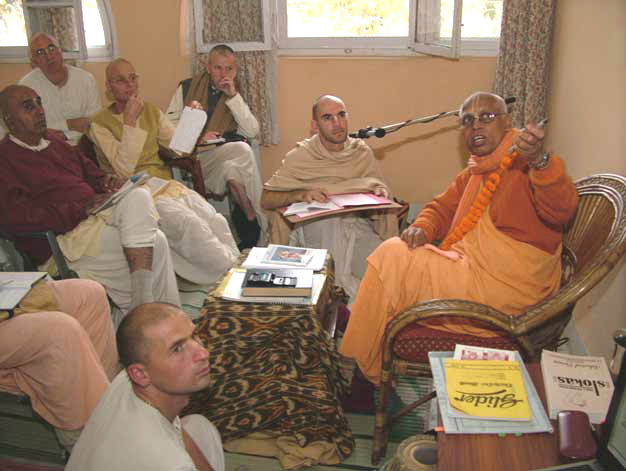 On Wednesday and Thursday, June 21 and 22, 2007, students of Bhaktivedanta College, at Radhadesh, Belgium, celebrated the end of the academic year. The first six students to complete the three-year Ministerial Programme were going to receive Bachelor of Theology degrees from the college, in partnership with the University of Wales Lampeter. This is a milestone in ISKCON history: Srila Prabhupada had recommended this sort of relationship between ISKCON and a university. INMATES at a jail in southern India are eating so well many are reluctant to leave and other convicted criminals are trying to move in. The Parappana Agrahara prison in Bangalore is crowded with 4700 inmates, more than twice its capacity, because petty criminals are refusing to apply for bail, the Bangalore Mirror says. Juvenile offenders are also overstating their age to qualify as adults and get in.